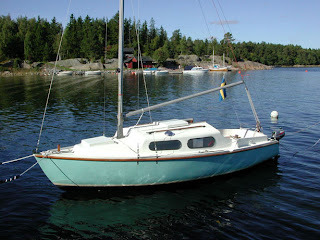 Alacrity sailboat: New content: Alacrity and Vivacity really the same? New content: Alacrity and Vivacity really the same? "I found your interesting magazine on your website, and concluded that if anybody knows the answer to my questions, probably you or one of your readers do. I'm in the final stages of researching a book on 350+ small cruising sailboats, including their sail plans and accommodations plans. In doing the research, I have come across several marketers who exaggerate the length of their boats to gain consumer acceptance. I am wondering if the Vivacity 20 marketers fit into this category. Note that NONE of these dimensions is within striking distance of, let alone equal to, the so-called "LOA" of 20.00 feet in the official specs, which some marketers use in place of the actual LOD and others use in place of hull length, and some even use as LOA, which it should be. As you know, LOD is the traditional measure of length when comparing one boat with another, so I am trying to determine the correct LOD for the Vivacity, and also for the Alacrity, which I am now beginning to suspect may be identical in LOD to the Vivacity. Can you advise if you have ever actually measured the LOD on your boat, and if so, what dimension you came up with? Also, can you comment on the same dimensions for the Alacrity?" Now, in fact I did not measure my boat according to those specs and think I am unable to as long as she is in the water. I can't say for certain but can throw in some ideas. The Vivacity 20 claims an LOA of 20' but the Alacrity 19 only claims an LOA of 18'6. (I'm guessing because it's over 18 they've kind of "rounded off" the model number to 19). If you say the claimed LOA of the vivacity is exaggerated, I'm wondering if the LOA of the alacrity is also exaggerated and it's closer to or less than 18'?